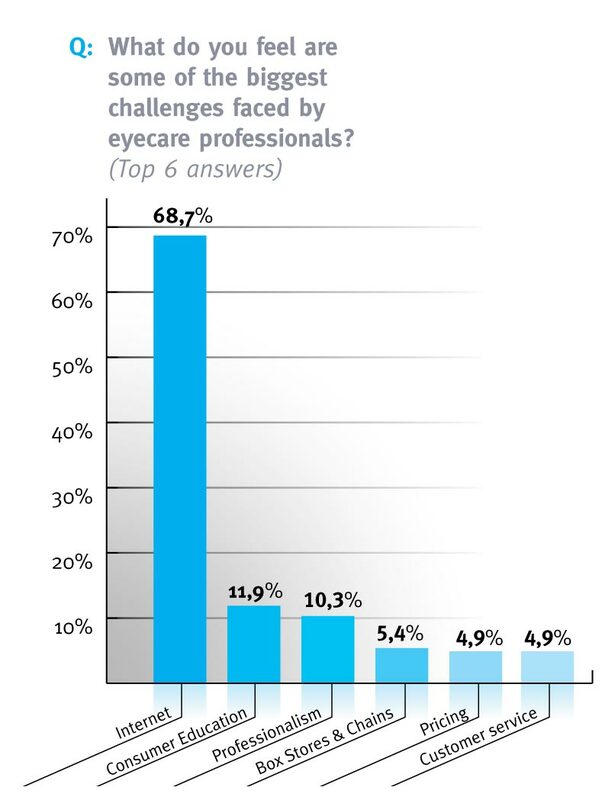 Envision: seeing beyond magazine recently conducted the first-ever survey of Canadian eyecare professionals (ECPs) to find out who they are and what’s on their minds. In the following story, we share some of what we learned. 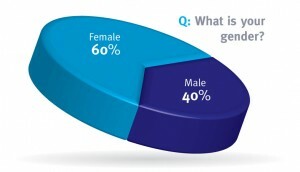 The survey yielded a great deal of information. So rather than presenting all of it, we decided to focus on the points that we believe will be of the greatest interest and value to eyecare professionals. This story covers a number of topics, including challenges and opportunities, marketing strategies, Internet and social media usage, and customer service. We hope it provides you with food for thought as well as action. Canada’s ECPs consider the Internet both an opportunity and a threat, according to the results of Envision: seeing beyond magazine’s 2012 survey of the three Os. Asked to identify the greatest challenges facing ECPs, fully 68.7 per cent of people who responded to the question chose the Internet. Consumer education, with 11.9 per cent of votes, ranked a poor second. At the same time, the Internet was the most popular choice among those who specified where they think future opportunities in the industry will come from. 15.7 per cent of respondents chose the Internet, second only to the 18.7 per cent who said they were unsure where those opportunities might lie. In the sense that the Internet is used as a dispensing vehicle for glasses and contact lenses, it represents a threat to both ECPs and consumers, says Ali Khan, chairman of theAcademyofOphthalmic Education. But while Khan might consider email access and a business website indispensable to optical professionals, not all ECPs seem to agree. Somewhat surprisingly, 11.2 per cent of survey respondents indicated their practice still did not have Internet access, while more than one-quarter (25.8 per cent) of the people who answered the question said they didn’t have a website. 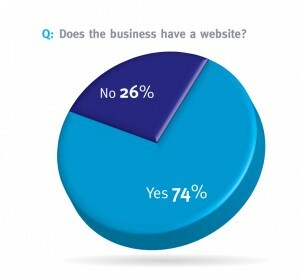 Interestingly, these results are in line with those of a recent Jobson Internet survey, which found that more than 22 per cent of the U.S. ECPs surveyed did not have websites. Dr. Patrick Quaid is an optometrist with IRIS The Visual Group inGuelph,ON, and co-chair of CCEPro. He expressed shock at the number of ECPs who said they did not have an Internet presence. “It probably has a lot to do with the ages of the ECPs who responded to the survey,” he says, noting that more than two-thirds of them (67.2 per cent) were aged 40 or older. Dr. Diana Monea was blunter. “If you’re not computer-savvy, you’re useless and if you don’t have a website you may as well close up,” says Dr. Monea, an optometrist who owns Eye Health Centres, a full-service vision care facility with locations inCalgaryandRegina. While CCEPro co-chair Dr. Michael Naugle agrees that ECPs should strive to provide outstanding service, he cautions that it’s easier said than done. Dr. Naugle thinks that one way to counter the Internet threat is to offer the newest technology available to the eyecare industry. “We should also have a more “value-based” option for the 20 per cent of the market who are price-sensitive,” he says. James Hollstein, owner/optician of Crystal Vision inRosetown,SK, has adopted this approach. Canada’s ECPs could learn a lot from watching their European counterparts, says Dana Sacco, a registered optician with Rossland Optical inWhitby,ON. Customer service is critical to the success of today’s optical professionals, agreed Dr. Trisha Beal, a partner at Brant and Paris Family Eye Care, located in Brantford and Paris,ON. The website has been a big success and Dr. Beal recently ventured into the world of social media, creating a Facebook page. That places her among the 44.2 per cent of survey respondents who said they use that social medium. 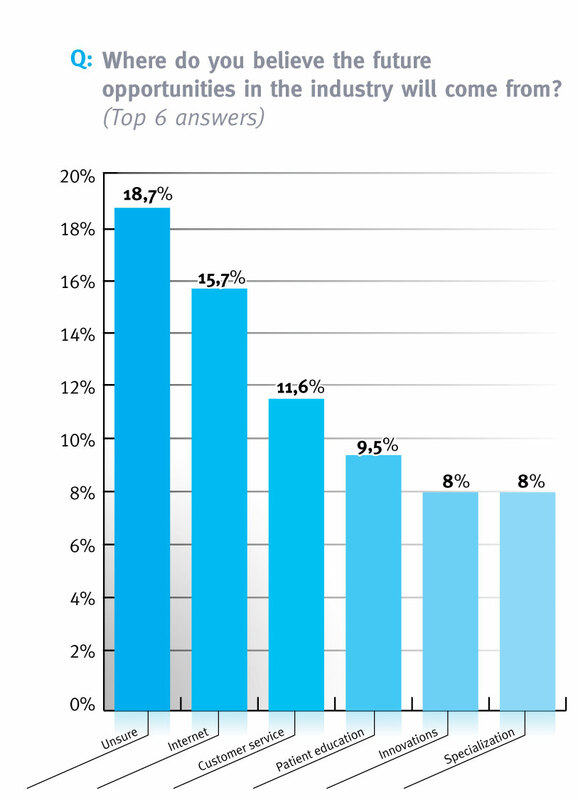 Only 12.1 per cent reported using Twitter, while 11.9 per cent said they use Google+. Just 7.9 per cent reported using LinkedIn and a scant 2.1 per cent said they used Pinterest. 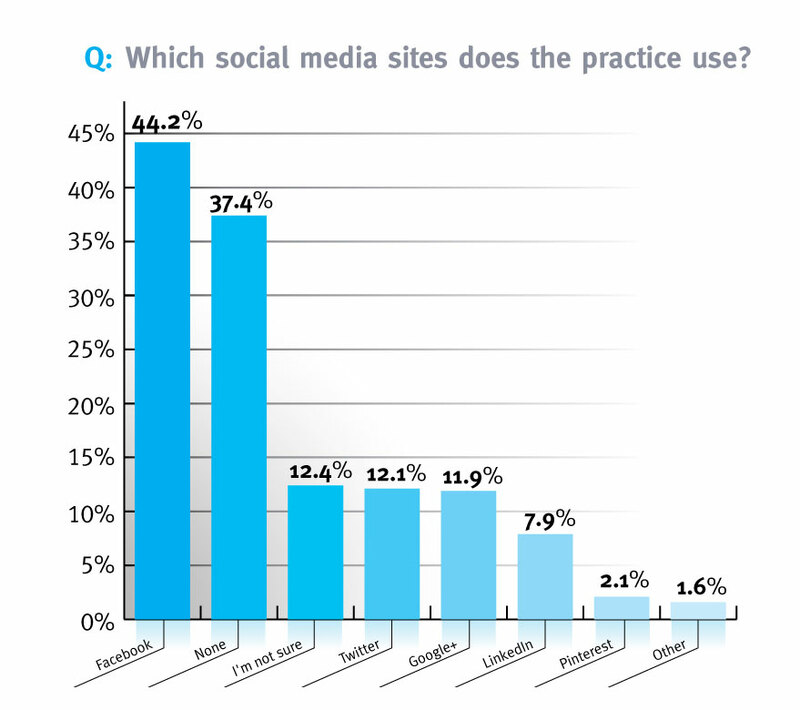 Meanwhile, more than one-third (37.4 per cent) of respondents said they didn’t use any social media. Just six months after creating her Facebook page, Dr. Beal says it’s too early to tell how successful it will be, but she noted that several of her colleagues have successfully run contests, which asked patients to like them on Facebook. Dana Saccorelies on word of mouth for all of her advertising. “I didn’t spend anything in 2011-12 except for the cost of maintaining my website,” she says. Sacco, who uses Facebook, Twitter, LinkedIn and Pinterest, adds that social media marketing casts a very wide net. Such a plan could include making a commitment to messaging on a regular basis, blogging, dedicating a percentage of advertising dollars to Internet ads, etc., Sacco says. 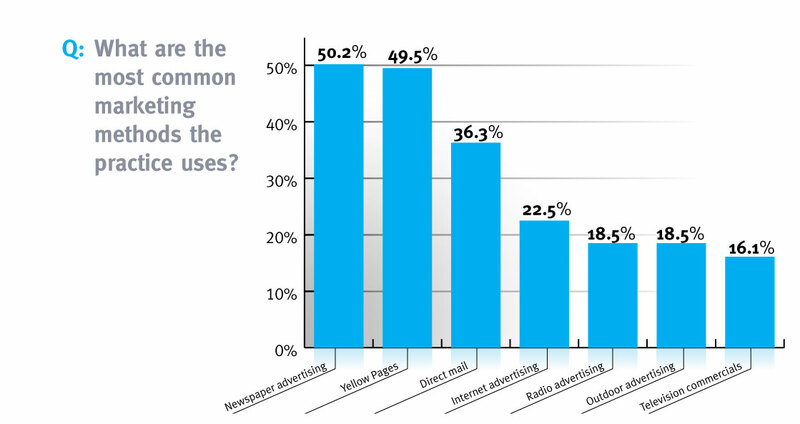 The Envision: seeing beyond survey showed that newspaper advertising remains the most popular form of marketing for 50.2 per cent of respondents, followed closely by the Yellow Pages with 49.5 per cent. 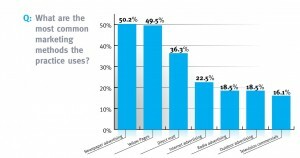 Direct mail was next at 36.3 per cent, while Internet advertising ranked fourth with 22.5 per cent. 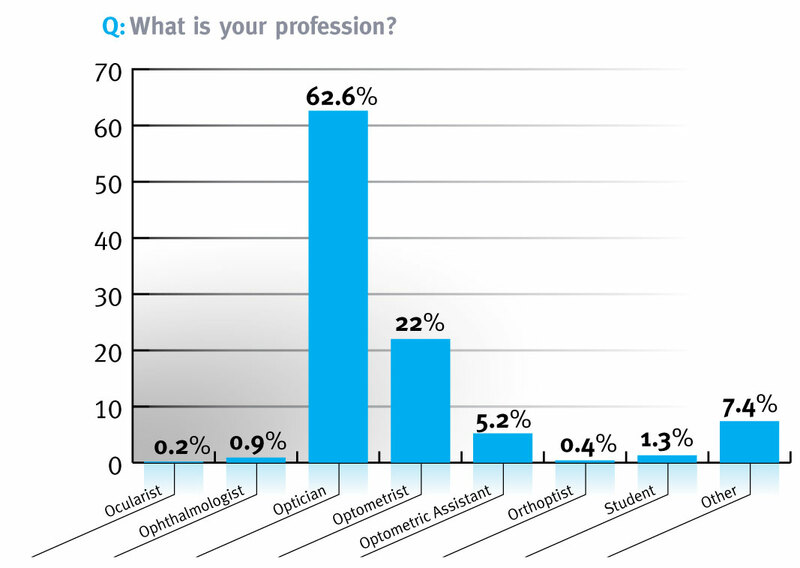 There were compelling reasons for undertaking the first-ever survey of Canadian eyewear professionals earlier this year, says Martine Breton, president of Breton Communicationsand publisher of Envision: seeing beyond magazine. “Over the years,Breton Communicationshas been a trusted source of information onCanada’s optical industry and, as a result, we have received numerous requests from both ECPs and suppliers for industry statistics that weren’t available anywhere. The survey took a fairly broad brush approach to its subject because it was breaking new ground, says Breton. “Now that we have the results as a point of reference, we’re thinking of conducting more specific surveys in the future,” she added. Over 130 questions under eight major headings – demographics, the Internet, sales, services, training, human resources and marketing, as well as questions on the challenges and opportunities facing ECPs – were formulated by Breton Communications staff, with input from industry suppliers. 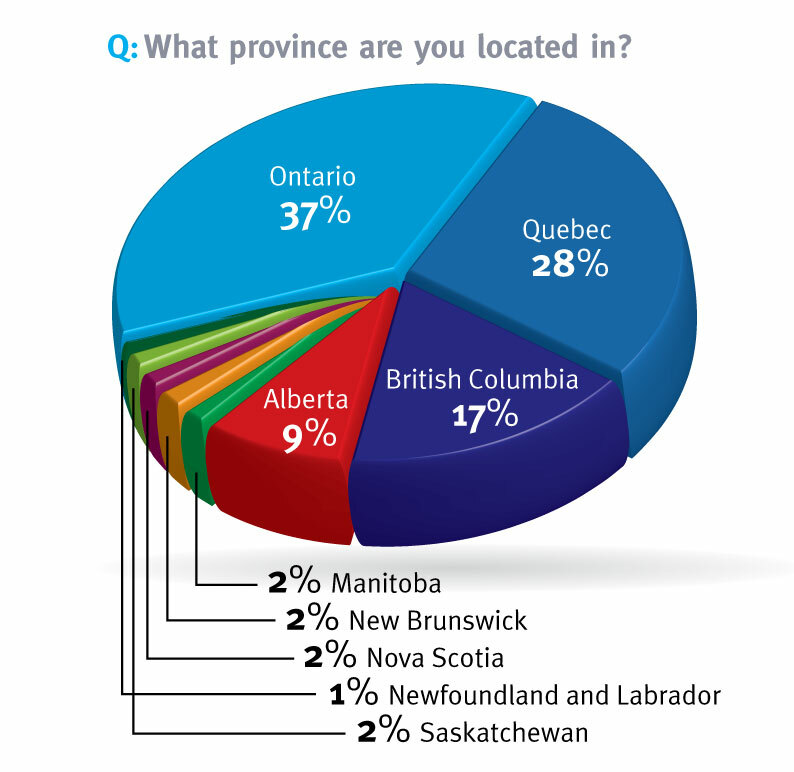 Just over one-third of survey participants (37.4 per cent) were Ontario-based;Quebec was second with 27.9 per cent and B.C. was third with 16.8 per cent.Alberta placed fourth with 8.8 per cent, while Manitoba(2.2 per cent) andNew Brunswick(1.9 per cent) ranked fifth and six respectively. 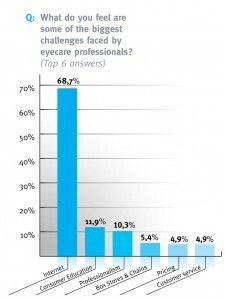 Almost two-thirds (63 per cent) of respondents said they were opticians, while 22 per cent were optometrists; 5.2 per cent were optometric assistants and just under one per cent were ophthalmologists. 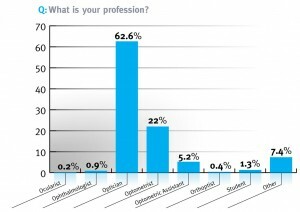 7.4 per cent identified themselves as “other”, including managers, sales reps, students and educators. Independent retailers made up about two-thirds (65.8 per cent) of the respondents, while those working for chain (three or more) stores accounted for 30 per cent of the replies and department stores represented 3.8 per cent. 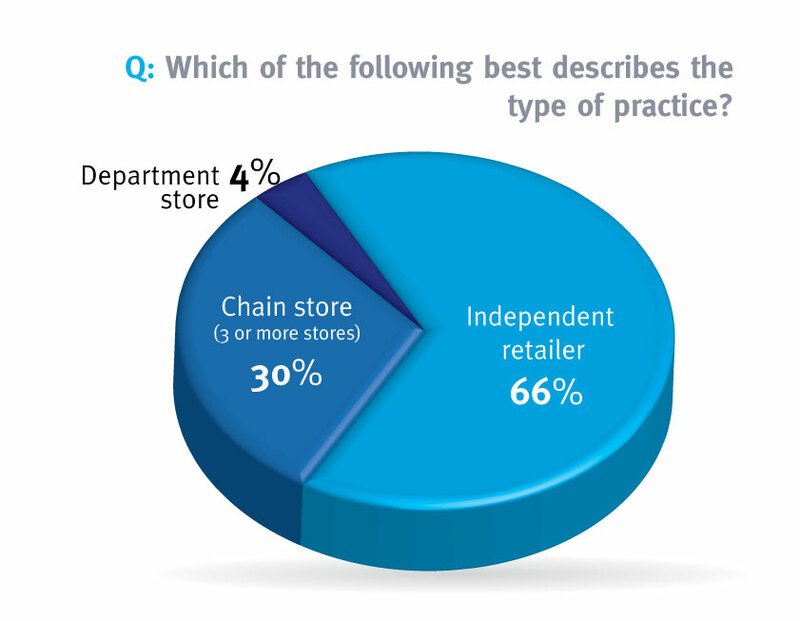 Among the independents, 34 per cent of retail locations were optometrist-owned and 65 per cent were optician-owned. Sixty per cent of our respondents were female and interestingly,Quebec accounted for the entire disparity in gender: 75 per cent of respondents from that province were women, while men and women accounted equally for the responses from the other provinces. The gender shift could mean that many new optometrists will enter the workforce on a part-time basis, since many younger women also plan to have children, Dr. Quaid added. 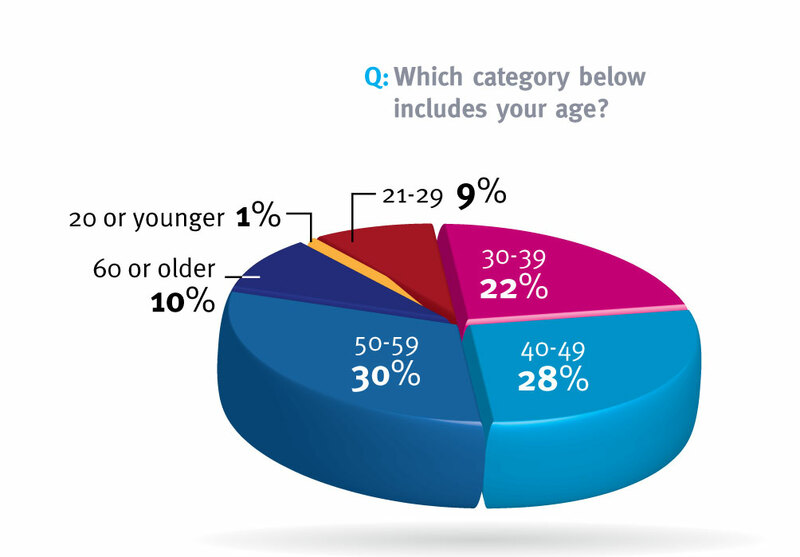 The survey’s results also revealed a graying industry: more than two-thirds of respondents (67.2 per cent) were aged 40 or older and just 31.7 per cent were 39 or younger. So it’s not surprising that 45 per cent of respondents have practiced more than 20 years while 28 per cent have spent 11-20 years in the field. The smallest category was those with five years or less of experience – they accounted for just 13.2 per cent of responses. Despite the economic challenges of recent years, news on the sales front was fairly positive. Asked to compare overall sales in 2011 with those in 2010, 8.1 per cent said they were significantly higher and 33.9 per cent said they were slightly higher. 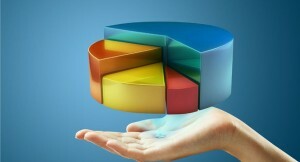 19.3 per cent of respondents said sales were about the same and only 28.1 per cent said their 2011 sales were lower.